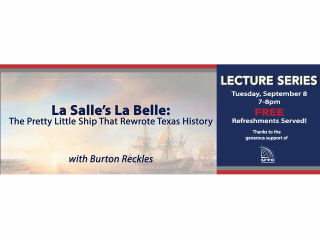 Houston Maritime Museum presents La Salle's La Belle: The Pretty Little Ship That Rewrote Texas History. In 1684, René-Robert Cavelier, Sieur de La Salle, set sail on the La Belle to establish a French colony at the mouth of the Mississippi River. The story of this ill-fated expedition and recent discovery of the 300 year old wreck is an epic tale of adventure, exploration, international intrigue and death. This history, now told through the conservation of its recovered 1.5 million artifacts, has enough bizarre twists and turns to satisfy maritime novelists like C.S. Forester and Patrick O’Brien. This lecture is the culmination of meetings with La Belle conservators and with Mr. James Bruseth, author of the book From a Watery Grave, who led the expedition that discovered the resting place of the La Belle in Matagorda Bay. Lecturer Burton Reckles will lead the way on this fascinating voyage.